Bishop Mark, along with The Bishops of England and Wales will shortly make a collective pilgrimage to Rome where they will meet with Pope Francis and report on the state of their dioceses. During their pilgrimage they will make their "Ad Limina apostolorum" visit –“to the tombs of the apostles". While each Catholic bishop is obliged to make this trip every five years, the last Ad Limina visit made by the England and Wales’ bishops took place in 2010. This photograph shows the Bishops are seen having just visited the Tomb of St Peter in the Vatican. Please click on the thumbnail if you would like to download and read this important statement about the revelations of historical child abuse within the Church. 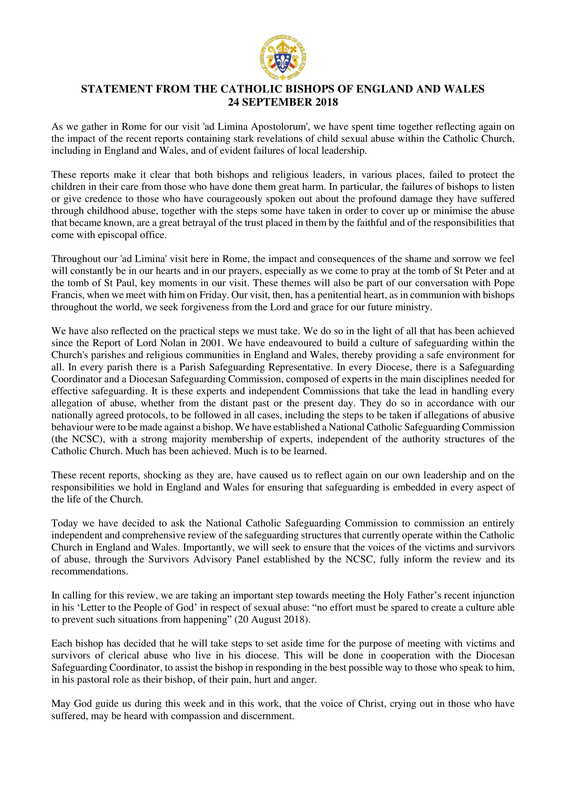 Bishop Mark has also made a statement about these revelations, and if you would like to read it please click here to download his Pastoral Letter.